Sony Pictures hack: Was North Korea really the culprit? 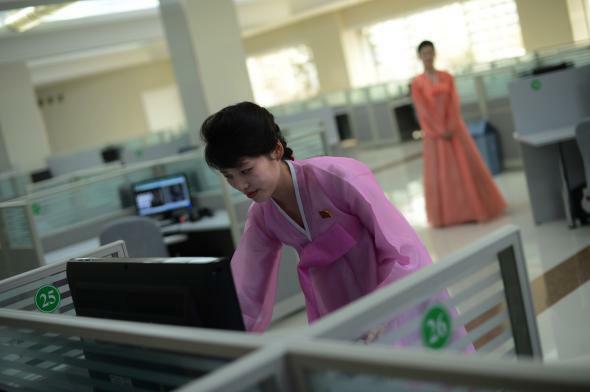 A North Korean woman uses a computer at a software company in Pyongyang in 2012. Sony Pictures suffered a brutal cyber-attack on Nov. 24. The hackers, who call themselves #GOP, for Guardians of the Peace, leaked 3,800 employee Social Security numbers, plus salaries, layoff plans, tons of username/password combinations, and some not-yet-released Sony Pictures movies. It was rough. Sony Pictures is working with cybersecurity company Mandiant and the FBI to control the damage and investigate the hack. And out of the rubble, a theory started circulating: What if North Korea hacked the company in retaliation for it making the upcoming comedy The Interview, which makes fun of the country and its leader, Kim Jong-un? The idea has been gaining traction. North Korea is weird and vindictive, and was really mad about that movie. It totally would do this, right? Actually, maybe not. Experts have doubts. In a blog post on North Korea Tech titled “Did North Korea Hack Sony? Probably Not,” Martyn Williams outlines his reasons for being skeptical of the theory. He explains that though North Korea is thought to have instigated various cyber-attacks on South Korea—including one major hack that took out broadcast TV and ATM networks for a while in 2013—the country is usually covert about what it’s doing. If the hacking theory seems flawed to you simply because most North Koreans don’t even have access to a cellphone or computer, much less the Internet … that is a very reasonable point! But the country definitely has some hacking clout, even if it’s not super-sophisticated about it. Frank Cilluffo, the co-director of the Cyber Center for National and Economic Security at George Washington University, testified before Congress that North Korea’s cyber-attack prowess “poses an important ‘wild card’ threat, not only to the United States but also to the region and broader international stability.” And a 2009 U.S. Forces Korea report showed that North Korea regularly succeeds in infiltrating United States networks. It seems like the country has at least a few hundred if not a few thousand hackers working on intelligence-gathering and good old scams.